VPI(Vacuum-Pressure Impregnation) with Epoxy resin. Ranging in capacity from 0.5 to 56,400 horsepower, Mitsubishi brand diesel engines offer a series of versatile power generating systems. Mitsubishi Heavy Industries Engine & Turbocharger, Ltd. has continually introduced upgraded its engine products since the inception of business in 1917, and now the MITSUBISHI MGS genset provides a higher generating power rating and more advanced control systems than ever before, with proven reliability based on the continued research and development. The best performance-matched engine system configured with Mitsubishi diesel engines and Mitsubishi turbochargers, which are engineered and manufactured in the same facility, is certain to result in the high productivity and improved fuel efficiency. Every unit is inspected and tested before leaving the factory and the test report is sent with the genset. MITSUBISHI MGS - All Mitsubishi assembled, tested and supported. 4 pole, screen protected, drip-proof IP23, self-exciting, self-regulating and brushless with fully connected damper windings, salient pole rotors, A.C. exciter and rotating rectifier unit. The insulation system is Class ’H’. All windings are impregnated in either a triple dip thermo-setting moisture, oil and acid resisting polyester varnish or vacuum pressure impregnated with a special polyester resin. Electrical design in accordance with BS5000 Part 3, VDE0530, UTE51100, NEMA MG1-32, CEMA, IEC34-1, CSA22.2 and AS1359. 6 and 12 wire*1 reconnectable windings provide a wide range of 3 phase voltage. 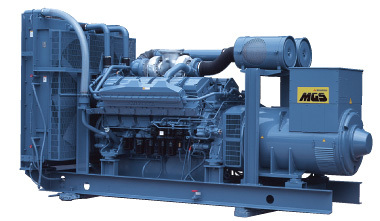 The exciter field system remains at full strength, sustaining a high level of short circuit current at the ac generator output terminals by means of the excitation voltage via AVR powered by the independent winding, Permanent Magnet Generator (PMG) as a standard feature in the MGS genset, which is electrically isolated from the main alternator stator windings. The fully sealed, three phase*2 RMS voltage sensing AVR maintains the voltage within the limits of +/-0.5%*3 from no load to full load including cold to hot variations at any power factor between 0.8 lagging and unity allowing for a 4% engine speed variation, suitable for applications with greatly unbalanced or high non-linear loads associated with UPS systems. The AVR has built-in protection against sustained over-excitation, caused by internal or external faults. This de-excites the generator after a minimum of five seconds. THF (as defined by BS4999 Part 40) is better than 2 % and a TIF (as defined by ASA C50.12) is better than 50. Radio interface: Suppression is in line with the provision of BS800 and VDE Class G and N. Note: *1 12 wire reconnectable windings are the features up to Code H6 models. *2, 3 Up to Code K5 models have single phase voltage sensingand the voltage regulation within +/-1.0%, for 4% engine speed variation. Turbo-filter is standard and paper element dry type air-cleaner is available as an option. "Full-sized" safety and automatic functions in the series of digital control systems Easy human interface in the sophisticated control system makes for an operator-friendly genset. MGS standard 7310 programmable microprocessor control - automatic start/stop panel, generator breaker control, indicating the operational status and fault conditions; automatically shutting down the engine and indicating the engine failure by means of LCD display and LEDs on the front panel. Electrical design in accordance with BS EN 60950 Low Voltage Directive, BS EN 61006-2 and 61006-4 EMC Directive. The optional interface can provide real time diagnostic facilities.